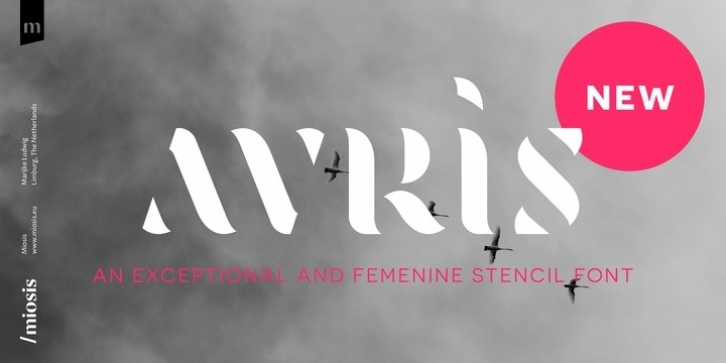 This is Avris, an exceptional and feminine stencil font. The base was designed in 2015. The word 'avris' derives from the latin rara avis, which means "rare bird". Stencil fonts were initially designed for mass production and transportation companies. Unlike this one, Avris' curvy and minimalistic design feels and looks like the wings of birds, flying above the quiet ocean. It also has a roman, calligraphic and cryptographic touch to it. It can be used for editorial (fashion) magazines and poster designs. Looks great in headlines! Also the numerals are a must see when you put it in use.